this will be a quick post today and this is a busy day for me, and I really should be betting dressed and out of the house soon. I made these tags for the Make It Monday Challenge and I wanted to show them to you. I only have one PTI tag and I used that, but then my challenge button went to work. I looked at other dies that I had that may make a tag. I found one. Here is the first tag. I used the Book mark die and cut it twice. Added the sentiment with Platinum embossing and the jingle bells and holly. Yes, the Garden Gate can make a great tag. I just traced the gate so that I could have a solid back and used the gates at the top of the tag. Inside it says a gift for you and a big red bow, from Tinsel and Tags. I die cut a poinsettia from IO and added it to the front gate. I do have to run off, but thanks for brightening my day with your comments. This is the inspiration photo for the Blog Hop which will take place on Nov. 25th. I was inspired by the ornaments and the beautiful colors. I really just went with that simple inspiration. Here is the card that I did. Using the Circle Doodle background stamp, I made my background with water colors.I used my Zig markers and a water brush, coping the colors in the photo. Over the top of that, I die cut from silver paper, the PTI Dangle Stars die. I added the words Merry Christmas from the same paper. After all was glued in place, I added sparkly silver to the stars and the works. This card really has a sparkly shine to it. I hope that you all had a wonderful Thanksgiving Holiday with family. I certainly did enjoy mine. Thanks for brightening my day with your comments. This is the photo inspiration for this challenge. All of the traditional Christmas images that we associate with the holiday. Therefore, traditional colors are the main theme of this challenge. Red, Green and White and Gold is optional That is easy Peasy! Here is the card I did. Card base is Gina K Designs White heavy card stock, then a layer of Cherry Red. I stamped the holly from Power Poppy, Holly Golightly stamp set, all around the edge, black Memento ink. They are colors with copic markers. The berries have red sparkly stickles on them. The sentiment is from Gina K, Holly Jolly stamp, as well as the black gingham ribbon. I got a traditional Christmas card. 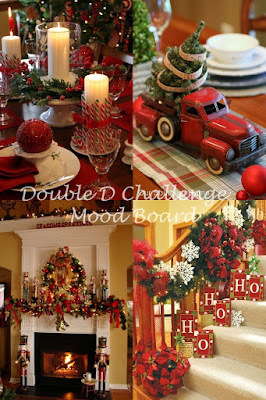 Mod Squad challenge, Ribbon, Ribbon Just for fun! Thanks so much for stopping by, your comments brighten my day. It is time for Seize the Birthday Challenge. Take some time from your holiday card making to make a birthday card. You know that you will need them. This month the Topping is Presents, so you could combine that with a Christmas card. I don't have the reactive mist, but I had a pen that a BFF gave me that worked well. I used double sticky tape for the teal banner. Just like Lydia did. Stamp set is Power Poppy Party Time. I used a water coloring card stock and my distressed markers to color. Peacock Feathers, Salty Ocean, Mowed Lawn, Peeled paint, Picked Raspberry. Archival Ink , Watering Can. Thanks for stopping by for a closer look. Happy Thanksgiving and a Merry Christmas to all. I was inspired by this card from Nicole Heady. I loved the die cut and the simplicity of the card. I die cut the word for the PTI Big Hugs die and left it monochromatic. I tried colors behind it, but didn't like it as well. Next, decorating was easy, as I die cut flowers and leaves from Autumn Color Pop. Then a few sequins. I really like how this turned out. Thanks so much for stopping by, Your comments brighten my day, always! This will be a quick post today. I was making Christmas cards and wanted a change of color. I sure got that with the inspiration photo. I use only three Distressed markers to make my card and layered them to make a darker color. 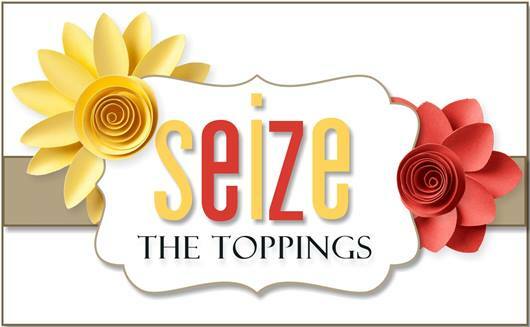 They are Faded Jeans, Festive Berries, and Mustard Seed. This is the stamp set Spring Daisy, from Altenew. I used clear embossing powder on Water colors paper and then water colored the flowers and leaves, with the colors of the inspiration photo. After drying, I added a border on the side from Penny Black. There are two different borders in this pack called Border edges and I used them both. There is one in the inside too. A few sequins form Pretty Pink Posh in 4mm, Marigold. Thanks for stopping by to take a closer look, Your comments brighten my day! 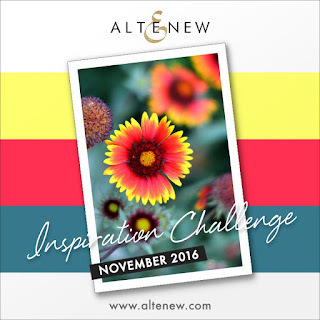 Power & Spark for November - Think Pink! 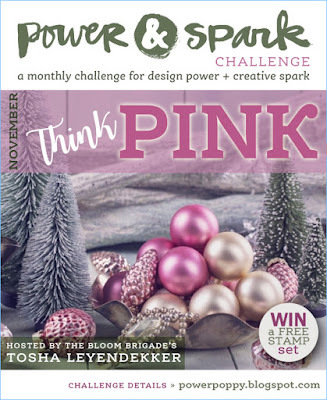 Tosha Leyendekker has challenge us to Think Pink for this month's challenge. Here are her words. I just got some new stamps set from Power Poppy and I also treated myself to a new pack of designer paper. I was inspired by the set called Holly Golightly and Recollections Christmas/Noel paper pack. This is a 6X6 card because I loved the paper and want to use all of it. The silvery snowflakes are so shiny and there are white ones too. I went with a silver and pink card. After stamping the holly, with versamark and embossing with silver powder, I colored them with Copic R83, R85, R56. Then fussy cut out two of the holly sprays. I did the same with the tag, but sponged that with Distress ink in Spun Sugar and Picked Raspberry. I used a newer die from Simon Says called Believe. I cut a vellum background for that and the word was die cut in silver. The vellum is colored from the back with the Copic R 85. Card stock is Gina K Designs in Dusty Rose and I added a bit of pink gingham ribbon to the card too. the sentiment on the tag is from Simple Joys stamp set. I will need to make an envelope for this special size. Thanks for your comments, They really brighten my day! 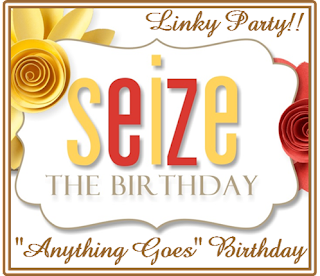 It is time for another fun challenge at Seize the Birthday. I'm sure we are all busy making Holiday cards this time of year. Fall, Halloween, Thanksgiving and Christmas Cards. But, we still have those birthdays to remember the people in our lives. Nice to have them on hand, to mail out as needed. The stamp is Altenew Persian Motifs. Stamped with Platinum EP and heat set, then colored with Distressed markers. The sentiment is stamped on a strip of vellum. I am your host this week at the Mod Squad Challenge. You may have made a lot of Fall cards, and are now thinking about the Christmas ones that you need. So here is our challenge. The challenge this week...Just put some gold on your project. Lots or just a little. It must be gold. A $20 gift certificate for the store at Gina K Designs. I could not help myself, I love using gold and I made two cards for you. The first card uses the Sending Love kit. This kit includes sentiments that you can run through a heat embossing machine. I colored the flowers with a copic marker and the rest is all gold. For the second card I went to Black Onyx card stock and stamped with the trees from the Christmas Wishes. I did some gold embossing around the edges too and added gold twine. One birthday card and one Christmas card, all with gold. Come on and play along with us. It is a random winner, so everyone has a chance.